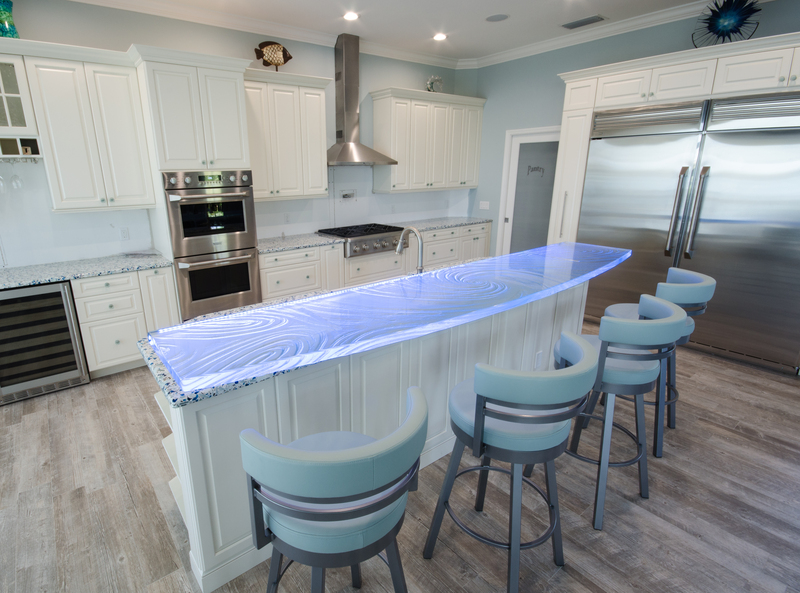 When clients approach Downing Designs with their ideas about their custom glass countertop, we first discuss with them how their space “flows”, and their ideas. We always learn new things from our clients. Always. We always want to know how a person will enter the kitchen or bath, as this angle is critical to our design. From there we present a series of scale countertop sketches where the texture seamlessly flows with the room. This is how we go about our signature design technique, and in our experience, it does two things: It “greets” people with an inviting linear texture that “pulls” you further inside the glass work. Second, it elongates the room, enhancing its looks and value. This takes skill to thoughtfully execute correctly, while at the same time creating an original work. This is where the participation of our clients infuses our designs with fresh new ideas. 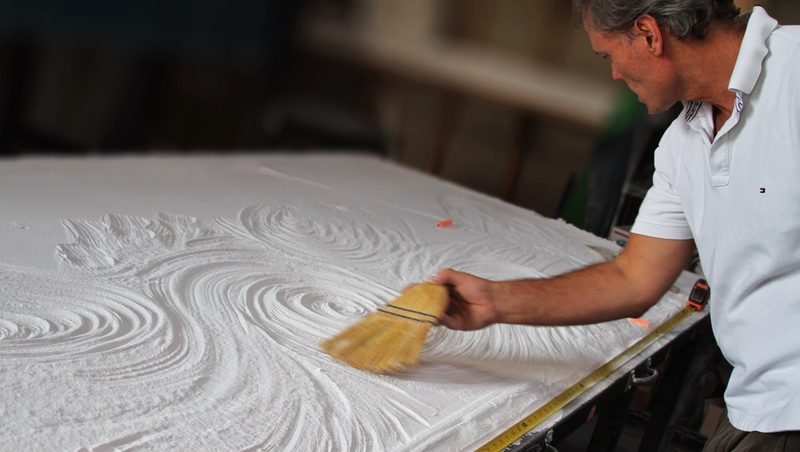 We create our textures right in front of the client, first lightly sketching in our sand bed, then deepening our kiln carving to create their centerpiece. Opening our studio to clients is a great way to get a free preview of the work, and the client-artist interaction is assured to give the best result we can offer…and is very important to most of our clients. The experience is highly interactive…as we become immersed in the design of the overall form that our glass will take. This gives them the opportunity to tell us just how they feel about their piece in terms of: curvaceousness, open space vs textured, Cat 1 or Cat 5 hurricane, etc, etc. All of our hurricanes are finished by the client “signing” the piece with their finger to create the eye of the hurricane…and then is forever named after them. Its great fun, and a memorable experience in the creation of their masterpiece. The textured glass countertop that results is hand-crafted, thick, piece that is a sensational look in any kitchen or bath space. When looking into your next kitchen design, dont overlook the opportunity to co-author your commission…its one of the few areas where you will have ultimate control over the exacting look you seek.